The ATF Dingo is a German heavily armored military infantry mobility vehicle based on a Unimog chassis with a V-hull design, produced by the company Krauss-Maffei Wegmann (KMW). It is designed to withstand land mines, rifle fire, artillery fragments and NBC-threats. 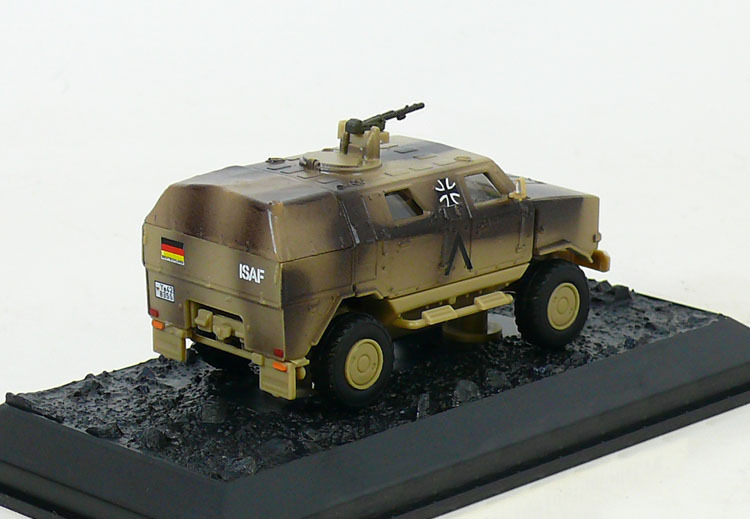 ATF stands for Allschutz-Transport-Fahrzeug, meaning all-protected transport vehicle in German. It is named after the Australian native dog dingo. The ATF Dingo has a modular design of the following five elements: chassis, protection cell, storage space, engine compartment, and its bottom mine blast deflector. Its design is lighter and includes an armored chassis with a blast pan instead of the more common monocoque hull found in modern blast resistant vehicles. IBD's layered Modular Expandable Armor System is used and the windows are angled to deflect blasts and bullets. A tarp is used over the back storage area instead of metal to save weight. A mechanical weapons station utilizing periscopes, borrowed from KMW's Fennek, is located on the top of the vehicle. The weapons station allows the operator to sit safely inside the cabin. 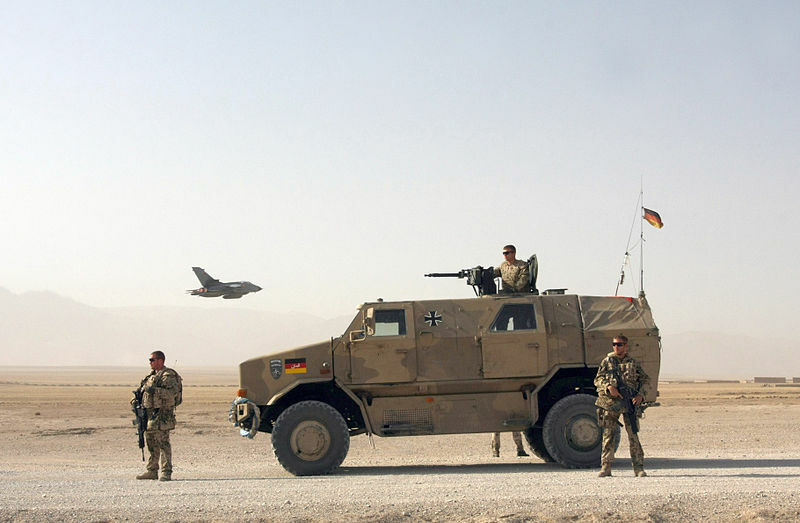 Recently the Bundeswehr ordered several hundreds of fully remote-controlled weapons stations from KMW for its Dingos and other armoured vehicles. - The light "FLW 100" (for the MG3 or the MG4) and the heavy "FLW 200" (for the M3M or the HK GMG). The weapons stations are controlled via a monitor inside the vehicle. 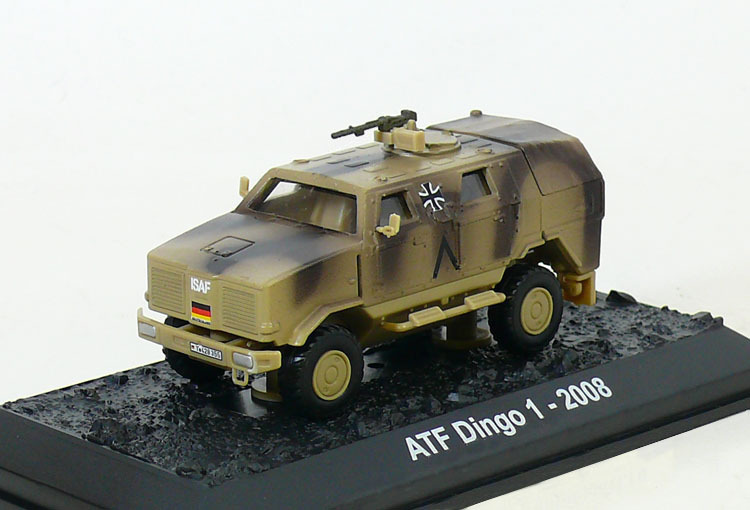 The ATF Dingo 2 is an advanced version of the Dingo based on the upgraded Unimog U 5000 chassis, that offers improved protection and more payload. It is offered in two versions with 3,250 (3.5 tonnes payload) and 3,850 mm (4 tonnes payload) wheelbase. The Dingo 2 can seat 8 personnel. Currently KMW is developing the Dingo 2 GFF for the German Army with increased internal volume. The Dingo's standard armament is a remote controlled Rheinmetall MG3 machine gun turret. The 7.62 mm MG can be replaced with a 12.7 mm MG or a HK GMG automatic grenade launcher.